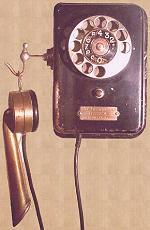 Although first phones required two power sources, the first to supply the microphone, the second for the call generation, the magnetic call were quickly introduced. They were used in conjuction with "regular" local battery phones , like this Aboilard from 1907. The Aboilard has been modified : it came on the first version with two earpieces and a front microphone, replaced later by an handset. In the twenties, fashion inspire to the manufacturers, the hygienic handset. The basic idea was to avoid any contamination by mouth when using regular handsets : they were seen as one of the reasons of the illness contagion. Thus, the shape of the cornet allowed the consumers to clean the microphone pipe, with the only help of a rag. 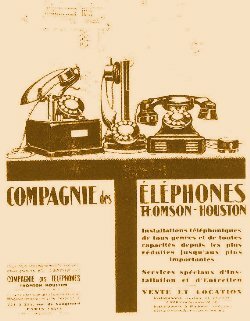 Handset were named " monophone or diaphone" according to the manufacturer. Microphone and earpiece are installed in the superior parts, the strange shape playing a cast of a ear trumpet. It's a fashion, so that, these telephone were more expensive and they did'nt succed to prove that they were really hygienic. 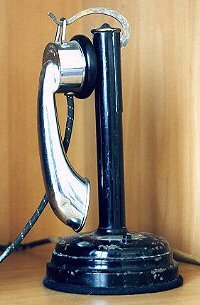 Ericsson 1920, with SIT handset.